Dr. Arletha McSwain currently serves as the Dean of B-CU Global Online and Professional Studies and Professor of Education at Bethune Cookman University. Dr. McSwain is the 2017 recipient of the United States Distance Learning Association Hall of Fame Award and has over 25 years of higher education teaching and administration. 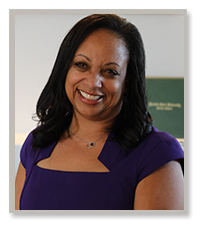 She previously held the position as the Dean of Extended Learning and Professor of Education at Norfolk State University. During her tenure at Norfolk State University, she provided leadership and academic expertise to support the design, development, and execution of the distance education programs in keeping with accreditation and federal guidelines. This exemplary leadership resulted in Norfolk State University’s distance education programs receiving Quality Standards Certification offered by the United States Distance Learning Association. Norfolk State University was the first university in Virginia to have received this national recognition. This same leadership has resulted in Bethune Cookman University being the first university or college in Florida to also receive the Quality Standards Certification offered by the United States Distance Learning Association.Dr. McSwain is the recipient of the 2013 Phenomenal Woman Award- NSU WoMen’s Economic Development Center (WEDC). Dr. McSwain is the 2011 award recipient for Innovative Excellence in Teaching, Learning and Technology – International Conference on College Teaching and Learning. Dr. McSwain graduated from the University of Missouri-Columbia with a Ph.D. in Early Childhood Special Education.